Andros, the second-largest and northernmost island of the Cyclades group, has a great naval tradition and no landscapes like the postcards from the typical Cycladic island: apart from the sandy beaches, there are rocky coastlines, mountain ranges alternating with fertile plains, lush vegetation and abundantly flowing streams. Andros is definitely worth a visit, not solely for its close proximity to Athens. The handsome main town of Chora, also known as Andros, is a ship-owners’ enclave packed with neoclassical mansions. Flights of stairs, a spacious square with trees, narrow alleys, remarkable churches and museums, shops, cafes and restaurants, give Chora its distinct character. At 16 km west of Chora lies Paleopolis that used to be the ancient capital of Andros, having prospered from the classical to the late Roman times. 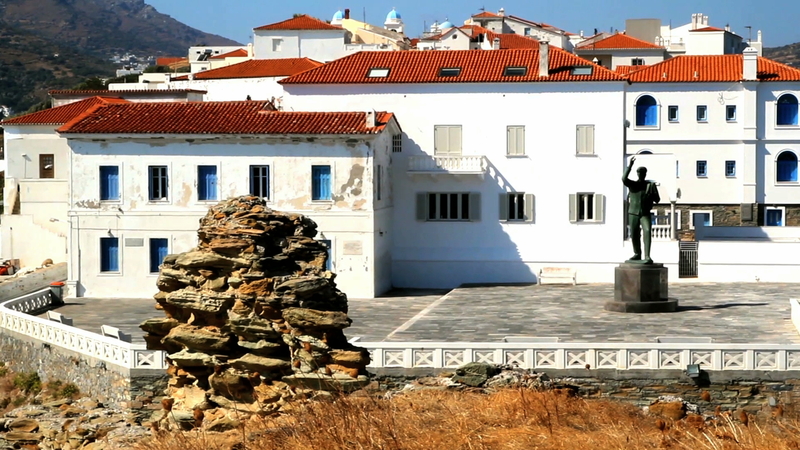 Andros can also satisfy the tastes of the culturally minded tourist, thanks to the variety and high level of its museums. The internationally acknowledged Museum of Modern Art, managed by the Vasilis and Eliza Goulandris Foundation, houses unique collections of paintings and sculptures, whereas in the archaeological museums in Chora and Paleopolis you will discover the ancient history of the island.